Overseas travel is a huge topic for retirees. Everyone's Bucket List, or whatever you call yours, seems to have several places they want to visit. Forbes.com recently published an article by Judy Martel titled: Globetrekking: the new retirement. The article features our friends and fellow authors, Tim and Lynne Martin. 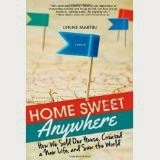 Their new book, Home Sweet Anywhere, highlights their retirement, and it isn't what you would typically imagine. They had a dream for adventure. After selling their home in California, they have been living in a variety of cities around the world. Their retirement is not for the faint of heart. They are very flexible, adventurous, and are inspirational for anyone who has a travel bone in their body. The book is a great read, but a lot more than that. It is full of insights on how retirees (or anyone with courage) can cast off the lines and head for parts unknown. Globetrekking has become another way Boomers are breaking the mold. We were interviewed for the article because as authors of the book, Don't Retire, REWIRE! and as "rewiring experts" to get our views on how people execute on their dreams. We think that not only do Lynne and Tim know themselves well, but they know their drivers---what motivates them. We highly recommend you read the article and apply it to the many aspects of your life...not just travel. Yes, packing it all in and leaving the country on an adventure is extreme, but you have to have some idea what's there when you arrive that will give you driver fulfillment. If you read the article with an open mind, be prepared to have it stretch your thinking and to be challenged to dare to imagine different things for yourself. Ask yourself..."Do I envy Lynne and Tim, or do I think their retirement choice is too extreme? Or am I somewhere in the middle." It takes courage to do what they. All we can say is BRAVO!! !